Welcome to Braylon's 7th Baseball Party! 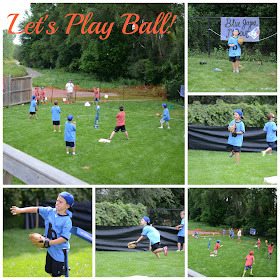 It was a beautiful day for some backyard baseball and water games. 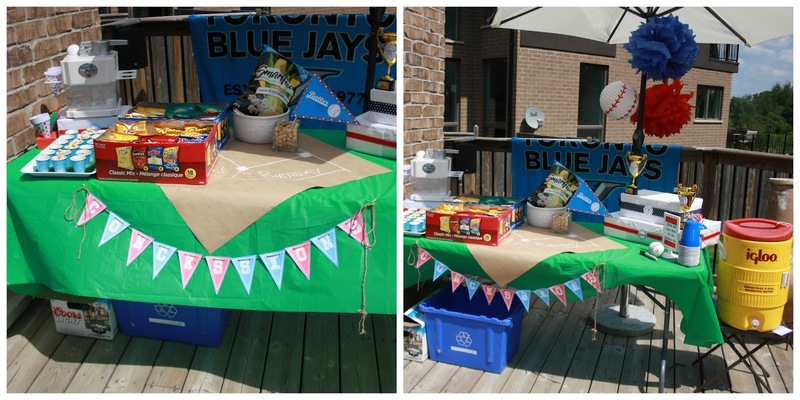 We painted our backyard like a baseball field. My husband even added a 'homerun' fence at the back of the field so that the boys could try to hit the ball 'out of the park'. The boys played Red Sox vs. Blue Jays. On the invitations we asked each boy to tell us what song they would like to walk up to bat to. The boys were announced and then their walk up songs were played. This was my sons favourite part of the party. One of my favourite parts of the party was the dugouts with the boys shirts hanging underneath. I put the boys first initial in lower case letters. I was happy with the way they turned out. You can find the tutorial for the freezer stencil t-shirts here. One of the first activities we did was the baseball game, Blue Jays vs. Red Sox. 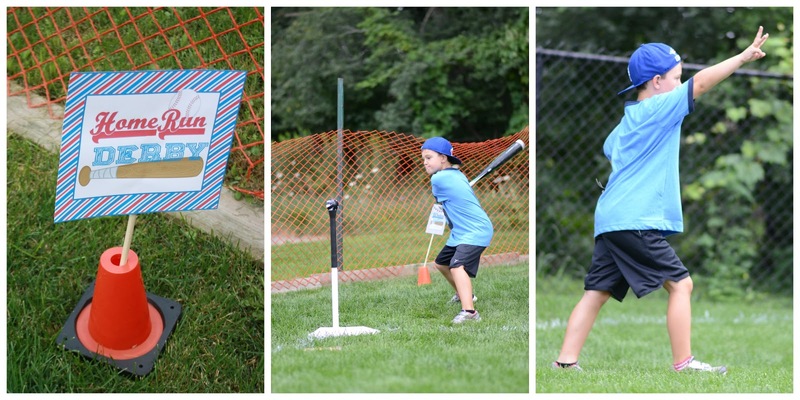 The kids had the option of hitting off the tee or from the pitching machine. This worked out great because every kid got a hit. Next, we did the home run derby. Each boy got three hits. 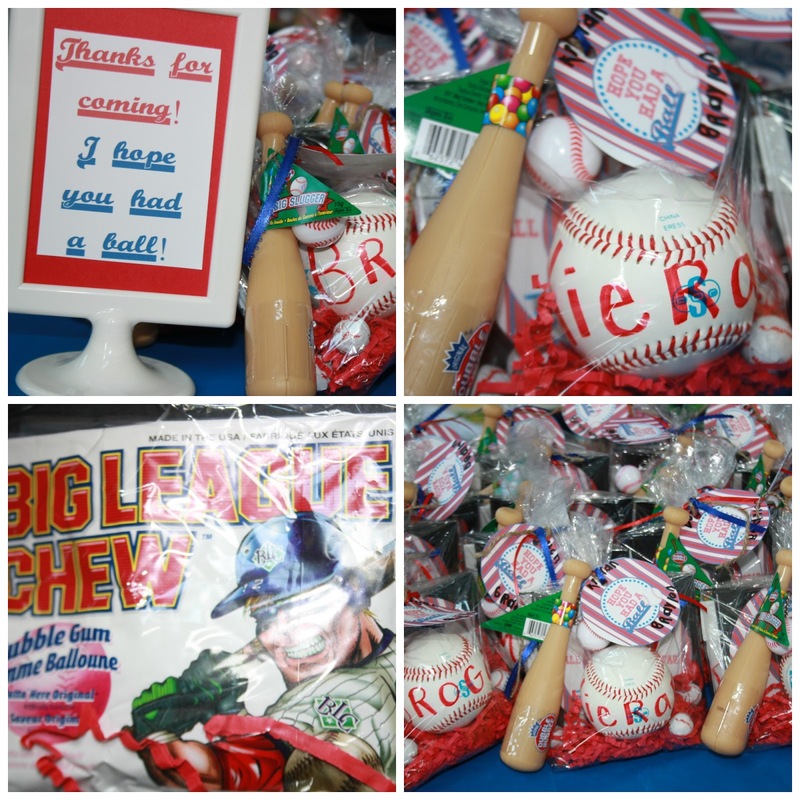 This was a huge success and most were able to hit one out of the park! Pitching accuracy was the next station. The boys got three throws each to try and hit the target on the fence. The last 'dry' station we did was running the bases. 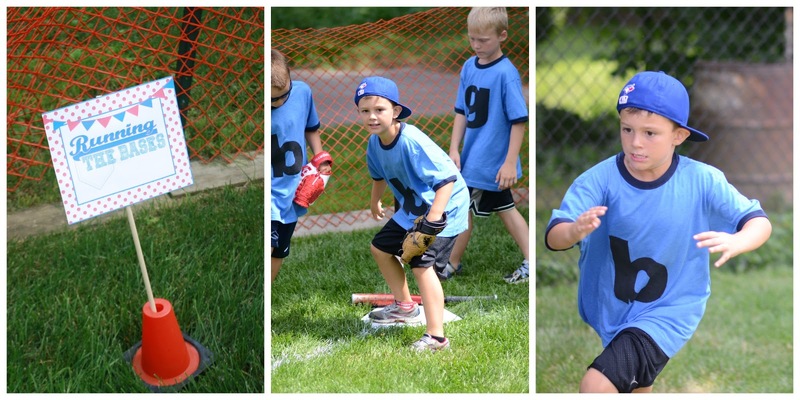 The boys ran the bases one at a time and were each given their time. They then went a second time through to try and beat their time. After lunch, the boys changed into their bathing suits and we started the water stations. First up was sliding. Bray showed the boys how to do a baseball slide and they each got a turn to practise on the slip and slide. It's funny how something so simple like a slip and slide can create so much fun and laughter. Another one of the water stations was water balloon catch. 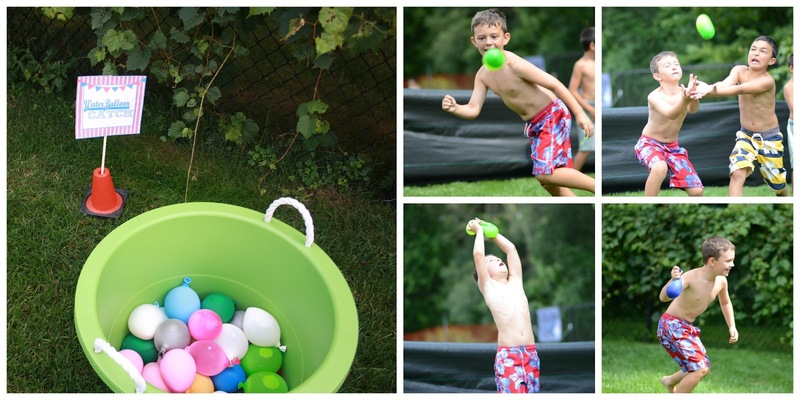 This started out as passing and catching with a partner, but towards the end of the time we gave the boys permission to do a water balloon fight. They loved it of course! The last water station was water baseball. 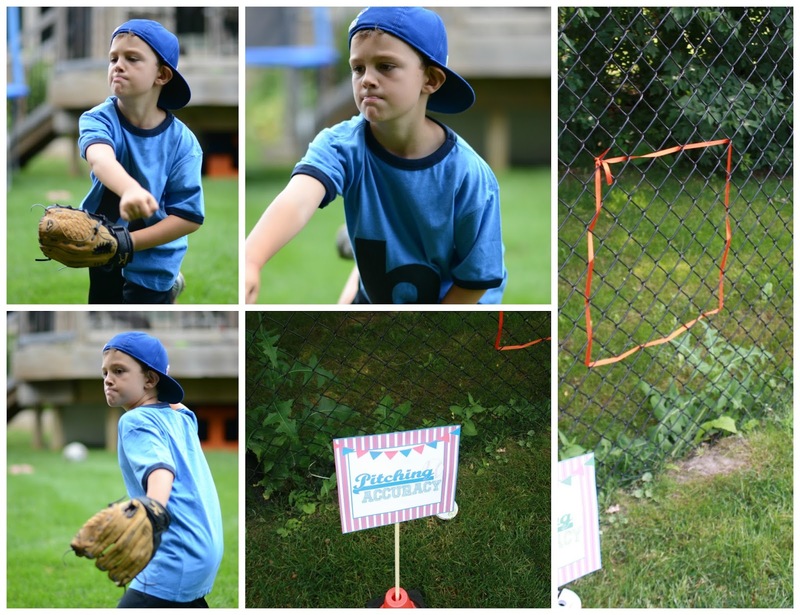 The boys got pitches from my husband and tried to hit the balloons with the bat. There was tons of laughter when the balloons would explode upon impact. What a fun station! For the kids party we set up a concessions stand and served pogo dogs, chips, fruit and veggies. The boys loved the sno-cone machine after they were finished their lunch. 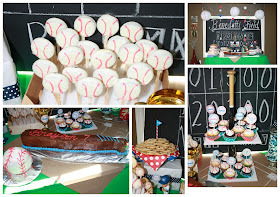 For dessert, of course we had cake (a baseball bat and ball) and cupcakes. The kids also got to choose cookies, cake pops, pie pops and chocolate covered oreos! Look how great the baseball bat cupcake stand looks with cupcakes on it! 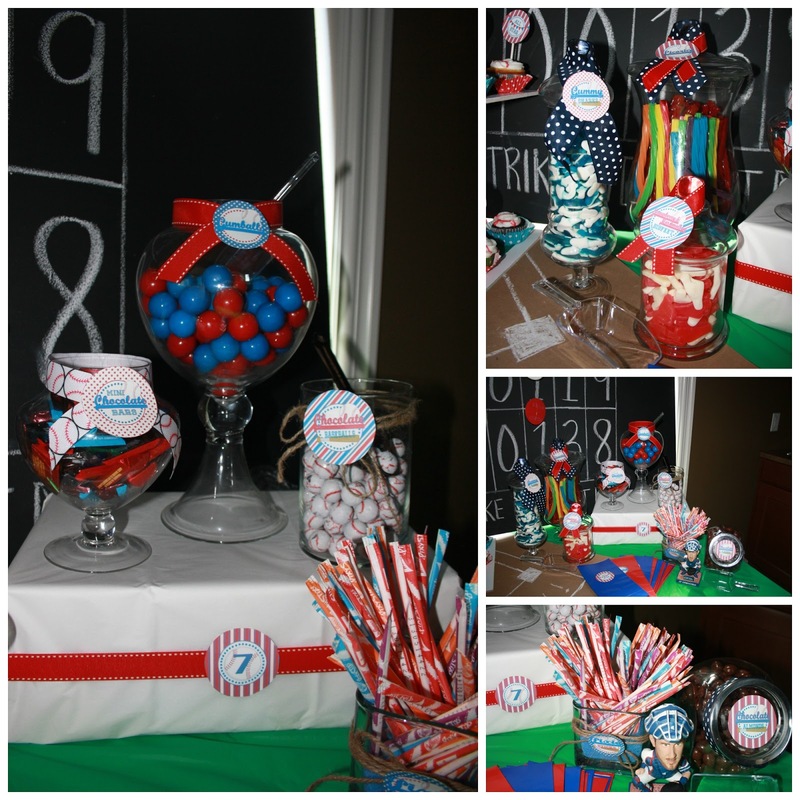 We also set up a candy bar which is always a huge hit! 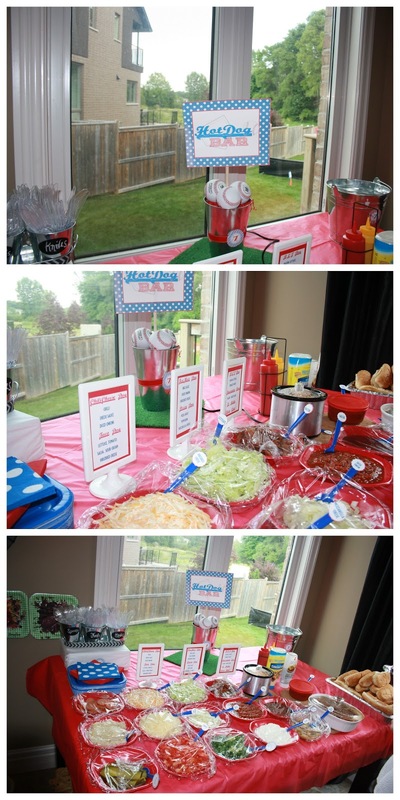 For the family party later on that day, we set up a hot dog bar. For this we just had tons of toppings. I made up sign for suggested hot dog topping combos like Tex Mex Dog, Chili Cheese Dog, Taco Dog and BLT Dog. We also served cold salads with the dogs. For refreshments we did a few punches as well as a sports cooler dispenser that had Gatorade in it. I love using the glass frappicino jars and mason jars to serve the punch in. 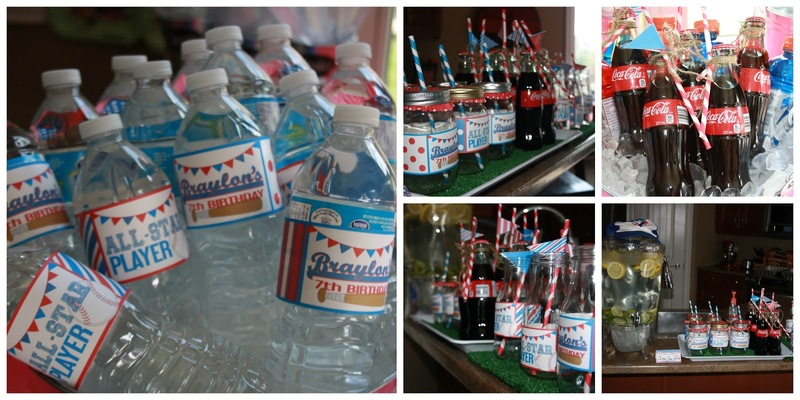 Bottled water and vintage coke bottles were put on ice in large galvanized buckets. The decor was very easy. 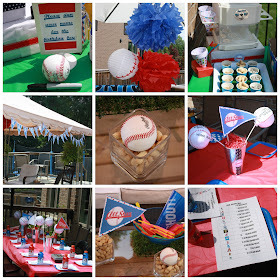 I had red and blue tissue balls hanging in various spot with white paper lanterns that were made to look like baseballs (with red sharpie lines on it). 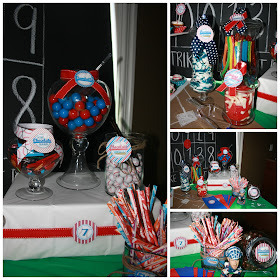 I filled glass jars up with peanuts and either had a baseball in the jar or a flag to match the party decor. I made up a baseball quiz for the boys to do when they arrived. They had to match the MLB logo with the team name. One of my favourite parts of planning the kids birthday parties is doing up the loot bags. This party was no exception. 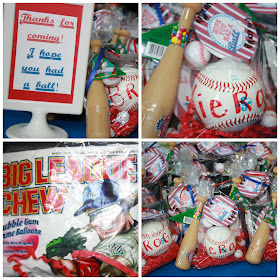 In the bags I put a personalized baseball, some chocolate baseballs, Big League Chew and a CD that had all the boys walk up songs on it. On the outside I tied a double bubble bat to the bag. It was a great day to gather friends and family together to celebrate a happy occasion. And what made it all worth it was this face!!! What a cute party -- looks like a happy birthday boy! Thanks for stopping by the #PartyTime link up. Hope you'll join us again next Tuesday! Hey, dear this Baseball party was truly amazing. Loved how this wonderful bash was organized. I really loved these pictures! I also need to host a baby shower for my best friend at some domestic Los Angeles venues but I can’t decide on a particular theme. Please help me dear by suggesting some cool baby shower idea!